Are You Commuting Through A Physics Experiment? If you are using the Holborn Tube Station in England, you are getting to work via the site of an important part of physics history. It was home to an experiment that moved physics literally underground for the first time, all in the search for the elusive neutrino. In 1934, people knew that the neutrino existed, but those who did knew it would be tough to spot. Still, they had a few good ideas on how to get a look at it. Physicists knew that when radium decays, it spits out electrons. They believed that it would also spit out an electron neutrino. Radium was relatively easy to get. Beta decay — the decay that resulted in the electron and its neutrino — was inevitable. The question was, how would one find the emitted particle? In the past, scientists had had good results with neutrons that had been slowed down. Slow neutrons were more likely to lodge in atoms, creating isotopes that were prone to decay and produce "artificial radioactivity." In 1934, James Chadwick of Cambridge tried a similar trick with neutrinos. He took a chunk of radium, put a block of neutrino-slowing lead next to it, and then placed a detector on the far side of the lead. The detector contained atoms that could be ionized by incoming particles, and the measurement of ionization would be the confirmation (or not) of the neutrinos. Having little else to go on, physicists tried making the experimental set-ups more sensitive. The problem then was interference from natural sources of radiation. One scientists, Maurice E. Nahmias, had the solution — he would go underground. Sheltered from other sources of radiation, he could conduct experiments and find the elusive particle. Deep caves were few and far between. Caves that could support all the experimental apparatus were even fewer and farther. So Nahmias went to a human-made cave. 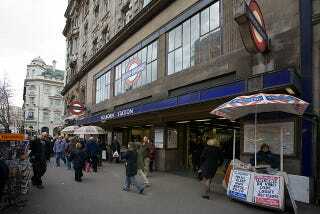 He conducted his experiments in the Holborn Tube Station, about 30 meters below ground. He didn't find it, but Nahmias did lead the way in neutrino research. Subsequent experiments, including modern ones, all take place underground. Nahmias also did get a result, even if it was a discouraging one. Using his experimental observations, he calculated that a neutrino could pass through 31,000 kilometers of air before it hit anything. Nahmias was clear that this was the lower limit. It was possible that neutrinos could travel through far more air without interacting with a particle along the way. Now we know that a neutrino could pass through a lightyear of lead without touching anything, so 31,000 kilometers of air was wildly optimistic. Still, commuters in London might have their day brightened by knowing that they walk through science history to catch a train to work. Top Image: David Iliff. License: CC-BY-SA 3.0. Second Image: Ged Carroll.